So there I was, the night before our camping holiday, ferreting around in the fridge trying to use up leftovers for our dinner. I was suddenly struck by a bolt of inspiration and I just have to share the results with you. Is there anything better than making something out of next to nothing taste and look spectacular? I find it hugely satisfying and feel very proud of myself at having managed to be clever and frugal and inventive all at once. It was late and after packing our cases ready for our trip I found myself staring into an almost empty fridge. 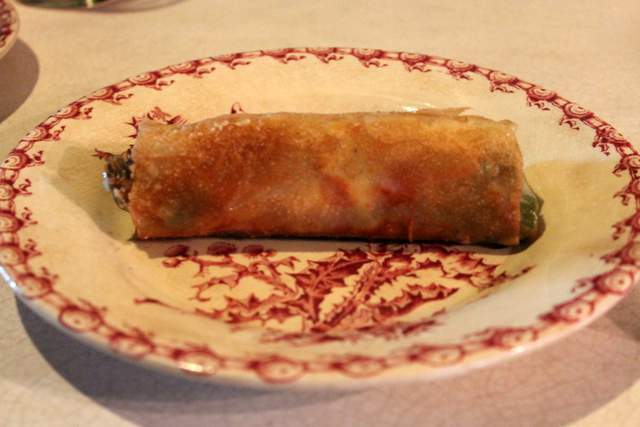 There were lots of condiments, a bit of cheese, a couple of slices of Bayonne ham, some odds and ends of veggies lurking in the drawer and a couple of old sheets of brick pastry left over from spring rolls I had made previously. At first glance this seemed a pointless endeavor but then I thought about a recipe I had just been reading in my trusty Jerusalem cookbook where Ottolenghi uses brick pastry to make little herby egg wraps which he fries quickly resulting in crispy little parcels of gooey eggy deliciousness. So, I took a some leftover spears of asparagus and cooked them in salty water for just a few minutes. Then I lay them on a slice of salty Bayonne ham, topped them with a generous slice of Camembert and wrapped them up. I placed that little bundle on to a sheet of brick and then wrapped that up like a little gift. Then I fried the parcels in some oil, with the join side down to seal first. Just a couple of minutes on each side and I had a crispy golden asparagus parcel ready to eat! And boy was it good! I would have loved to serve it alongside some peppery rocket salad but alas, the fridge was bare! So we just gobbled them up as they came and I think they were pretty stunning on their own! Perhaps next time I would use less asparagus in each parcel and more cheese so that I could have more parcels. Either way, they really were a stroke of genius that I shall be repeating very soon indeed and would proudly serve to guests. Not a bad effort for a mid week leftovers supper I think! First cook your asparagus n boiling salty water for 5-7 minutes, until just cooked but retaining a good bite. Drain and lay on a slice of ham and top with the camembert. Season well with black pepper and salt and wrap the ham around. 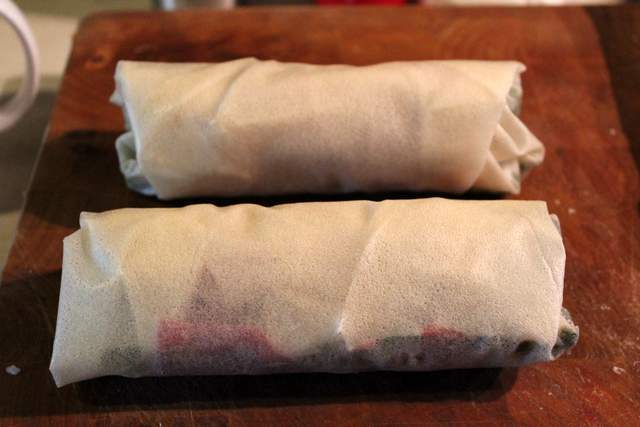 Then place on a sheet of brick pastry and wrap the bundle up like a present. Gently fry your parcels in the hot oil, seam side down first to seal, for just a couple of minutes on each side until golden and crisp. I am entering this little recipe into lots of lovely bloggy challenges! 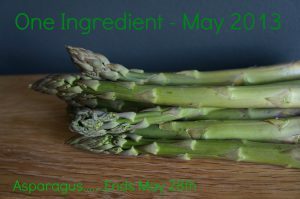 First off, this months One Ingredient Challenge which is the magnificent Asparagus! 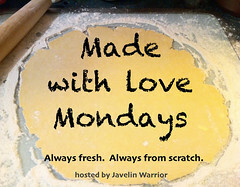 Co-hosted by Laura from How To Cook Good Food and Nazima from Franglais Kitchen. 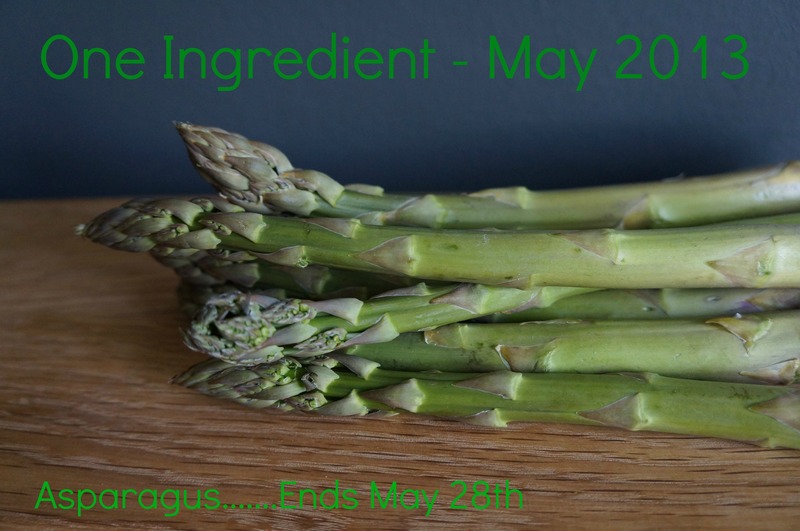 Be warned, I may have more Asparagus beauties coming your way this month! 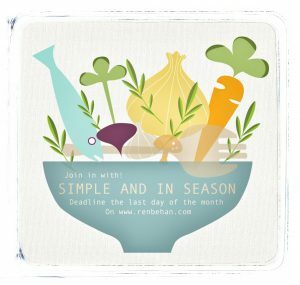 And as asparagus is happily in season right now and therefore very affordable, I am also entering this into Ren Behans Simple & In Season challenge. Aaaaand, because this recipe was literally made with the last few bits I had in my fridge, I think it qualifies for Credit Crunch Munch, this month hosted by Janice from the lovely Farmersgirl Kitchen blog. The challenge usually belongs to Helen from Fuss Free Flavours and Camilla from Fab Food 4 All. 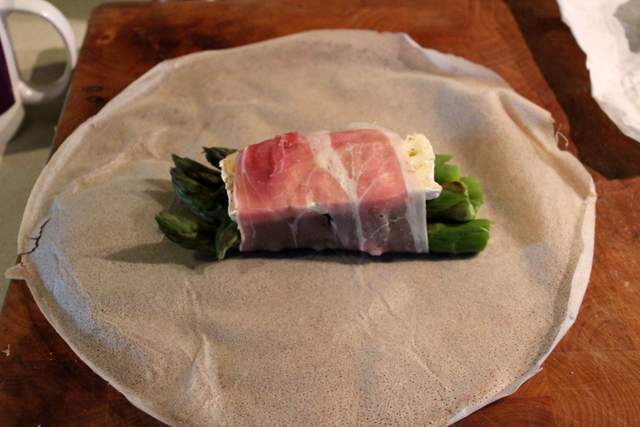 20 Comments on "Stroke of Genius Asparagus Parcels"
They look great, gourmet Credit Crunch Munch! Thanks Mum – I knew you would like these ones! You Masterchef genius! Now I would NEVER have thought of making these from your ingredients. They look totally sublime, and I’m now wondering what I could parcel up from the fridge! What a great and ingenious idea made form all of your fridge ingredients. I think they look delicious and would make a lovely lunch, dinner or starter. Delicate and stylish too! lovely anneli, i will definitely be doing this one soon! recently made a savoury bread and butter pudding with chive butter on the bread and asparagus bits throughout, courtesy ottolenghi, and it was absolutely delicious, ideas for doing it again with various other veg straight from the plot. Anneli, this looks delicious! 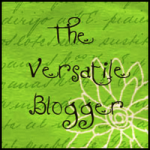 I ‘stumbled’ on your blog awhile ago (probably doing some sort of Google search). I am interested in French food- I studied cuisine at the Cordon Bleu school in Paris and I often feature classical French dishes in my blog. I look forward to seeing what you ‘cook up’ next! Thank you Fran! I have been over to your site and I am super impressed. GORGEOUS looking dishes. I am now following you so I look forward to seeing more Thanks so much for stopping by to say hi. Hi Anneli, that’s a very good looking meal made out of “odds and ends”! I love brick sheets – my wife makes the best bri(c)k I know – I could gorge myself on them, but it wasn’t until I spoke to my mother one day that I pondered the idea of actually using the sheets for other things. 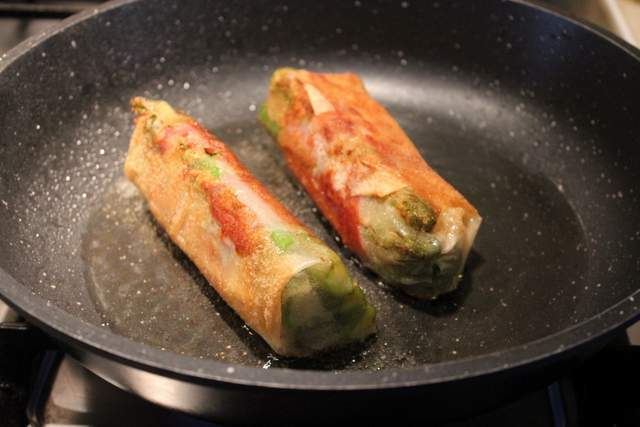 By the way – did you ever try baking them, instead of frying? It can be done with just brushing of oil, or perhaps none at all and it really gives it an excellent texture and crunch! We love asparagus, too – but never see it that cheap here. Thanks Nazima. Brick is really popular here in France. Filo is much more fussy to work with …all the buttering and layering. With brick you just fold it up fairly roughly and it just works! It’s a shame it’s not so easy to get hold of for you. Yes these would work cold on a picnic too…I had not thought of that!